Specify whether you want to publish only pages that have changed, or all pages. To publish subwebs, select the Include subwebs check box. 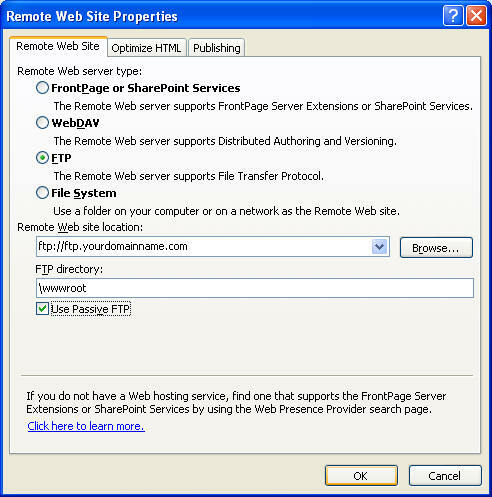 In the Remote Web site location box, type the location of an FTP Web server (for example, ftp://ftp.palouse.net, or ftp://personal.palouse.net), or click the arrow to select a location to which you have published before. If you are on the New Bugs Bunny server, enter "\wwwroot" in the FTP directory. Otherwise, leave it blank. FrontPage publishes your web. By browsing to your web, you can verify that your web was successfully published. If you cancel publishing in the middle of the operation, files that have already been published remain on the destination Web server.